These are the words Mike McCarthy used to defend his position on Dom Capers, his much maligned Defensive Coordinator, during his season ending press conference today. For the third consecutive season since winning Super Bowl XLV, the Packers made an early exit from the playoffs, losing 23-20 to the 49ers. And for the third consecutive season, McCarthy has been forced to defend keeping Capers as part of his coaching staff. The reason for having to defend his position is simple: Capers’ defense has plummeted from being one of the best in the league when he arrived in 2009, to once again being one of the worst. 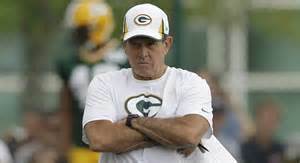 Statistically speaking, the stats would seem to support a change in defensive coordinator for the Packers. Yet McCarthy was adamant in defending Capers during his press conference today, which has left many are asking why? Whatever the reason is McCarthy continues to defend his stance on Capers, the unfortunate truth is under Dom Capers, the stats don’t lie. Perhaps they both should go… I’m not a big “fire so and so” kind of guy, and I’m not advocating such but change is necessary sometimes. Maybe that’s what the team needs? Capers is not the only variable in those 5 years. You also have to look at changes in personnel and injuries. You are correct-not every issue on defense is Capers’ fault. He is working with the players Thompson gives him. And that issue will be addressed soon. During the 0-3-1 earlier in the season, I did briefly discuss this at the end of this article. Maybe McCarthy is satisfied with being a middle of the road football team. The ONLY defense that could be justified to keep Capers is …IF Capers wanted veteran free agents and Thompson was not getting the players Capers wanted. This is hard to believe considering the Packers HAVE TALENT on defense. The defense is just not performing, this is due to poor coaching and motivation. Is it? Or is the problem maybe the talent on defense just isn’t that good? Trust me, I am in no way defending Capers as I have been one of his most vocal critics for years now. But maybe the issue is a combo of poor coaching (Capers) and not having enough quality talent on the roster to work with (Thompson). McCarthy has fallen victim to the same disease Don Shula had. shula had a top 5 offense in the league his last 6 years coaching. His defense was consistently at the bottom and Miami could not advance in the playoffs. Finally the owner demanded Shula get a new defensive coordinator or resign. Shula retired. McCarthy can’t make the tough decisions a head coach must make. Thompson needs to step and fire both of them if a change isn’t made. Unless Capers isn’t getting the players he wanted for his defense. I doubt this is the case. Every team has injuries. The Packers defense falls apart like a cheap suit in crunch time regardless of who is playing. It’s COACHING. The first game against SF was replay of the last by the defense. Capers defense has become tired and predictable! EVERYONE can see this, so why can’t TT or MM? There isway to much talent going to waste for these two to continue to collect their fat checks and sit idolly by, satisfied with mediocrity! OK-since you think Capers and McCarthy are also part of the issue, who do you propose replacing all three of them with? John… Who’s out there (quality) to be gotten? And that is why Capers will be around next season. Mm’s career and actual salary depends on how successful he is at being a HC..